Blizzard Conditions in Rural Iowa. Wintertime poses a wide range of threats to the American public. Whether it be exposure to the cold, vehicle accidents caused by slick roads, or fires resulting from the improper use of heaters, hundreds of people are injured or killed each year as a direct result of winter weather. Winter storms range from a moderate snow over a few hours to a massive blizzard with blinding, wind-driven snow that lasts for several days. Some winter storms are large enough to affect several states while others affect only a single community. High winds, freezing rain or sleet, heavy snowfall, and dangerously cold temperatures are the main hazards associated with winter storms. Impassable snow drifts often maroon people at home without utilities or other services for days after an event. Heavy snowfall and blizzards easily trap motorists in their vehicles and make walking to find help a deadly effort. Severely cold temperatures and wind chills during and after a winter storm can lead to hypothermia and kill anyone caught outside for too long. The aftermath of a winter storm can impact a community or region for days, weeks or even months, incurring steep economic costs. Blizzard: Blowing and/or falling snow with winds of at least 35 mph, reducing visibilities to a quarter of a mile or less for at least three hours. Winds lofting the current snow pack and reducing visibilities without any falling snow is called a ground blizzard. Sleet: Rain/melted snow that has begun refreezing when it reaches the ground. Sleet tends to be softer than hail and is easily compacted. Sleet can make roads slippery very quickly. The chart below shows how the different types of winter precipitation are formed. The National Weather Service issues four "tiers" of alerts to inform you of incoming hazardous weather. Please take a moment to review and understand the differences between them. Issued when significant winter weather is possible, but not guaranteed--a "heads-up"
Will there be any hazardous winter weather in the next several days? If any hazardous winter weather is expected, check back for later forecasts, information, and possible watches. On the Road: Unplowed/less traveled roads may be slick, so drive with caution. If blowing snow is occurring, drive at a safe speed and leave plenty of space between you and other drivers. At Home: Make sure you have the proper snow removing equipment to clear your sidewalks and driveways. 35 mph for at least 3 hours. On the Road: Seriously consider postponing any non-essential driving. If you must drive, carry a winter survival kit in your car and be prepared for delays. At Home: Make sure you have the proper snow removing equipment to clear your sidewalks and driveways. If an exceptionally high amount of snow is forecast, be prepared to remain at home for a day or two. rain and/or winds of at least 25 mph. A combination of sustained winds or frequent wind gusts of at least 35 mph and visibilities of less than 1/4 of a mile due to snow and/or blowing snow for at least three straight hours. On the Road: Refrain from driving except in emergency situations, especially in open country. Always carry a winter survival kit in your car if you must drive. High winds and white-out conditions will make driving extremely dangerous. At Home: Be prepared to remain at home for a few days, especially if you live in a rural area. Snow drifts may be higher than 10 feet, so make sure you have the proper snow removing equipment. A freezing rain event in which ice accumulations are expected to be 1/4 of an inch or more thick. On the Road: Refrain from driving except in emergency situations. Roads will likely be treacherous and maintaining control of your car will be very difficult. At Home: Be prepared for possible long duration power outages and refrain from walking on ice covered surfaces outside. Wind chill values are expected to fall to between -20°F and -29°F with at least a 5 mph wind. On the Road: Pack extra clothes and blankets in addition to your winter survival kit in your car in case you become stranded. At Home: If you go outdoors, dress accordingly by wearing well-insulated hats and gloves and putting on extra layers of clothing to keep warm. Frostbite could take place in as little as 30 minutes. Wind chill values are expected to fall to -30°F or less with at least a 5 mph wind. On the Road: Pack extra clothes and blankets in addition to your winter survival kit in your car in case you get stranded. At Home: Seriously consider postponing any outdoor plans. Wear well insulated clothing if you must go outdoors. Frostbite could take place in as little as 10 minutes. The wind chill temperature is not the actual air temperature, it is a “feels like” temperature when one factors in cold temperatures AND wind speeds. Increasing winds will accelerate the amount of heat lost by the body via exposed skin, driving down the body temperature. Animals are also affected by wind chill. The only effect wind chill has on inanimate objects, such as car radiators and water pipes, is to shorten the amount of time for the object to cool. The inanimate object will not cool below the actual air temperature. For example, if the temperature outside is -5°F and the wind chill temperature is -31°F, then your car's radiator will not drop lower than -5°F. The wind chill chart below was developed based on joint U.S.-Canadian research. The chart includes a frostbite indicator, showing the points where temperature, wind speed and exposure time will produce frostbite on humans. Each shaded area shows how long a person can be exposed before frostbite develops. Note: Wind chill temperature is only defined for temperatures at or below 50°F and wind speeds above 3 mph. Bright sunshine may increase the wind chill temperature by 10 to 18°F. Unusually cold temperatures are especially dangerous in areas not accustomed to them because residents are generally unprepared and may not realize the danger severe cold presents. Always remember to wear light, dry, loose fitting layers, mittens or gloves (mittens are warmer than gloves) and a hat to prevent the loss of body heat. Cover your mouth to protect your lungs from frigid air. Exposure to cold can cause frostbite and life-threatening hypothermia. Frostbite: Frostbite is damage to body tissue caused by extreme cold. It is most likely to affect extremities first, such as fingers, toes, ear lobes, or the tip of the nose. Hypothermia: Hypothermia is an abnormally low body temperature and begins to occur when a person’s body temperature drops to 3°F below its normal temperature, usually below 96°F, and can be deadly. Loss of feeling in the affected area and skin that appears waxy, is cold to the touch or is discolored (flushed, white, grey, yellow or blue). Handle the affected area gently and do not rub it. Warm gently by soaking the affected area in warm (not hot) water until it appears red and feels warm. Loosely bandage the area with dry, sterile dressings. If the person’s fingers or toes are frostbitten, place dry, sterile gauze between them to keep them separated. Avoid breaking any blisters and do not allow the affected area to refreeze. Uncontrollable shivering, numbness, glassy stare, incoherence, slurred speech, weakness, or loss of consciousness. Gently move the person to a warm place. Give rescue breathing and CPR as needed. Remove any wet clothing and dry the person. Warm the person slowly by wrapping him or her in blankets or putting on warm clothing. Hot water bottles or hot packs may be used to help warm, but must be wrapped in a towel or blanket before applying. Warm the core first (trunk, abdomen), not the extremities (hands, feet). Warming extremities first could cause shock, or drive cold blood towards the heart, causing heart failure. Do not warm the person too quickly, such as immersing him or her in warm water, as this could lead to dangerous heart arrhythmias. Being safe in dangerous winter weather means not only to taking the appropriate steps during the storm, but also having the right supplies beforehand. If you wait to stock up on supplies until a watch or warning is issued, you run the risk of the supplies being out of stock or the store being closed. Fall is an excellent opportunity to check the winter supplies in your home & vehicle and stock up on anything that is running low. The checklist below provides some basic guidance on what to have in your house/apartment during the winter should you be trapped by the snow or lose electricity. This is not an exhaustive list. Food and water are vital necessities during a winter storm; however, these foods should be safe to consume should power be lost. Use the checklist below to help stock your shelves. If permissible, a generator is a valuable asset to power key household appliances. Carefully follow all directions provided with the generator! Additional information on assembling home disaster kits can be found on the FEMA website. During severe winter weather, the best advice is to stay inside your house. Plummeting temperatures and high winds that often accompany winter storms allow frostbite and hypothermia to set in quickly if you are outside. Also, road conditions will likely be very treacherous, especially if you live in rural areas. Monitor local media outlets for the latest information on the storm. Make sure you carry a winter survival kit in your car in case you get stranded. You can use a large plastic tote or box to hold all of the needed items. If you already have one in your car, go through it and make sure it is fully stocked and ensure that any perishable items are still good to use. Items that should be in a winter survival kit are covered in the checklist below. Travel in the day and do not travel alone. Drive cautiously and leave plenty of space between you and the car ahead of you. Break out your emergency winter survival kit! Turn on your hazard lights and hang a distress flag from the radio antenna or window. Remain in your vehicle where rescuers can find you, unless a shelter is VERY close. Periodically run the engine and heater for about 10 minutes every hour to keep warm. Check the exhaust pipe every so often and slightly open a downwind window to avoid carbon monoxide poisoning. Eat and drink regularly but avoid caffeine and alcohol. Exercise to maintain body heat but avoid overexertion. Take turns sleeping with one person awake at all times to look for rescue crews. Once the storm passes leave the car and proceed on foot, if necessary. Below are some tips for staying warm if you must venture outside in a winter storm or cold weather. Wear several layers of loose-fitting, lightweight, warm clothing (shirts, pants, socks, etc.) rather than one layer of heavy clothing. The outer garments should be tightly woven and water repellent. Wear a hat which will prevent the loss of body heat. Pack extra warm clothes, such as coats, hats, and mittens, as well as an additional change of regular clothes should you get wet. Many times, especially in the fall, warm summer-like weather can precede a dangerous winter storm, lulling people into a false sense of security. Let friends and family know your travel plans and carry a cell phone. Ask people back home to routinely check the weather and call you if conditions are expected to deteriorate. If you own a smartphone and have internet access at your location, you can use your phone to check on the latest weather conditions and if any watches and/or warnings are issued. 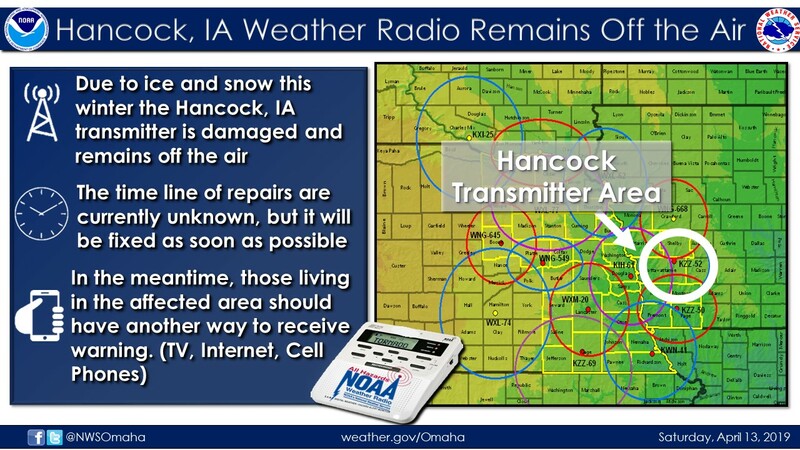 Carry a portable radio or NOAA Weather Radio to check on weather conditions. If a building or structure is nearby (less than a quarter of a mile away), seek shelter there. If there is no shelter nearby, Stay Put. You could become disoriented by the blinding snow. Build a lean-to or hollow out a snow cave to shield yourself from the wind. Stay dry and cover all exposed parts of the body. Start a fire for heat and to attract attention. Place rocks around the fire to absorb and reflect heat. Do not eat snow because it will lower your body temperature. Melt it first.